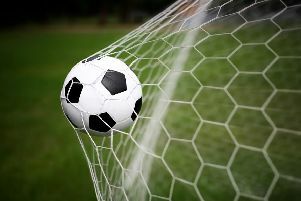 Hastings United Football Club’s six-match unbeaten run was ended by its heaviest league defeat of the season this afternoon (Saturday). Chris Agutter’s side was beaten 4-1 away to Herne Bay in the Bostik League South East Division after going 3-0 down at one stage late in the first half. Hastings remain second in the table, but the four teams immediately below all won this afternoon to close in on them slightly. The game kicked-off 15 minutes or so late after the referee became injured in the warm-up. The locally-based Matt Goldsmith, who was due to be one of the linesmen, took over the whistle. Agutter made two changes to his starting line-up from last weekend’s 3-0 win at home to Whyteleafe. New signing Temi Eweka came in for his debut and Tom Climpson was promoted from the bench. Hastings were on the back foot early on and fell behind after just five minutes. The ball was chipped over the away defence and Danny Leonard ran on to it before slotting into the corner of the net. Herne Bay doubled their advantage in the 26th minute. This time the ball was chipped over the top down the flank, Climpson was outpaced and Jake Embery slid his finish into the corner when one-on-one with Hastings goalkeeper Charlie Horlock. Hastings started to get things together and it seemed possible they could still salvage something from the game, but Herne Bay added a third goal in the 44th minute. The hosts broke out of defence and Leonard rolled home his second from a one-on-one situation. The away team went straight down the other end and pulled one back right on half time. Daniel Ajakaiye swooped on a loose ball in the area and fired into the net. Sam Adams came on for Jahmal Howlett-Mundle at half time and made a difference. Hastings controlled much of the play and looked a lot more solid at the back, as well as more threatening in attack, during the second period, but Herne Bay stood firm to preserve the advantage. Herne Bay, who have now won five of their last seven games, cleared off their goal-line a couple of times and goalkeeper Simon Overland made a few good saves. The hosts put the outcome beyond any doubt with a fourth goal in the 80th minute. A Herne Bay attacking player went through and unselfishly squared to give Embery a tap in at the far post. It was a better second half from Hastings’ point of the view, but by then the bulk of the damage had been done and 16th-placed Herne Bay were worthy winners. Hastings: Horlock; Eweka (Fielding 81), Howlett-Mundle (Adams HT), Climpson (Bamba 60); Azeez, Lovatt, Cruttwell, Dixon, Black; Ajakaiye, Mongoy. Subs not used: Walker, Fielding, Ibrahiym. Attendance: 291.